First Presbyterian Church has been a part of Mt. Pleasant since 1871. Since this time it has grown and evolved into a warm and welcoming congregation that prides itself on acceptance of all God's children. Upon entering the parking lot on Sunday you can feel the connection with others even before you reach the front doors. Pastor Andrew Miller is often standing at the doors welcoming people in before the service. He tries to make sure that the connection is felt for all upon coming to church. The acceptance and welcome do not stop there as the church congregation have also taken up the charge that we have never met a stranger. Mt. Pleasant has a lot of talented individuals and we are excited to have a diverse congregation who are open to share their talents with the church and community . Sharing our talents isn't the only thing we do as a congregation. As Presbyterians, we love to come together to socialize and share a meal together. One of the first things that people will see when they come to First Presbyterian Church is that the Doors are Open and God's Love is there to share with all! Come as you are! We would love to have you worship with us. There is no specific dress code. Wear whatever you feel comfortable in- whether that is dressy or casual. You can worship God anywhere and in any type of clothing. Children are encouraged to be a part of service and if they would like to go to Sunday School they are able to go after the Children's Sermon.We have a nursery for young children. The 2nd Sunday service is an inter-generational service that involves all of the congregation, no matter what age! 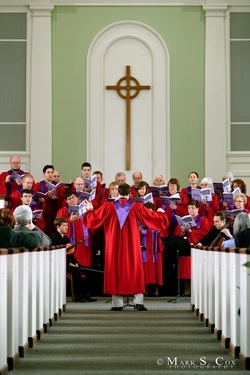 This service often includes the youth in a primary role of the service. Fellowship always follows Sunday service! The children will be the first to tell you what we do after service - cookies and lemonade! This is otherwise known as fellowship. No matter if we are in the church or on the road we are doing the work of God.